At Agapitos Patisserie Gifts to Greece, the art of presentation matters! A beautiful wrapping heightens the sense of anticipation for the person fortunate to receive a gift. And when gorgeously wrapped, any gift can be worth so much more than the sum of its parts. With the custom gift wrapping service (for free), you can be sure that your gift will make a special impression. Each present is uniquely wrapped to fit the gift occasion or your recipient’s own style. Your associate, friend or loved one will know the forethought and care you put into their gift. or you can contact us to discuss your packaging requirements. 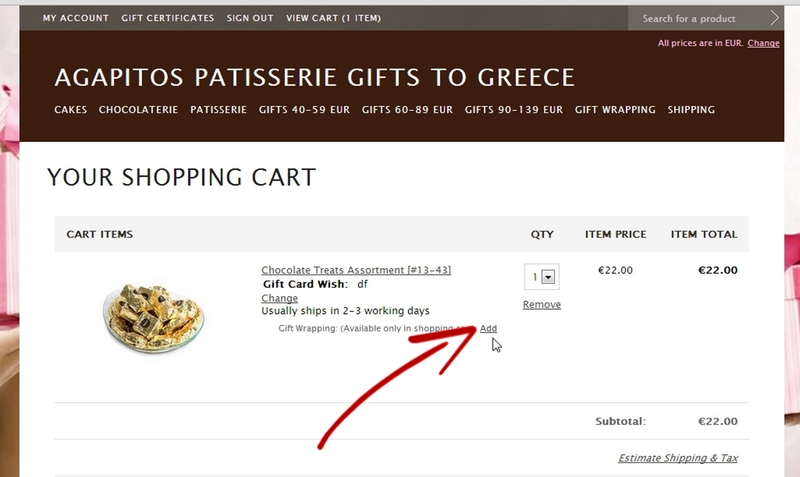 Please note that you can use the gift wrapping option only in the shopping cart menu. When you've finished adding items to your Shopping Cart, click the "VIEW CART" button. In the shopping cart you have the opportunity to select "Gift Wrapping: (Available only in shopping cart): Add ". Click on Add. A new window will open then you can choose how you'd like to have this item gift wrapped. If you have any questions, please don´t hesitate to contact Customer Service.